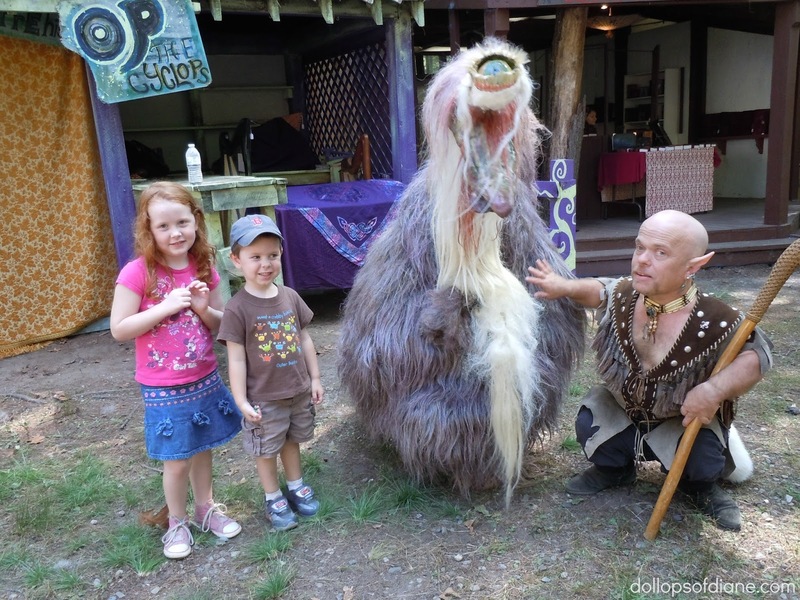 Dollops of Diane: King Richard's Faire: Ticket Giveaway! King Richard's Faire will soon be open weekends from August 31, 2013 through October 20, 2013 (including Labor Day Monday and Columbus Day Monday) in Carver, MA. Have you been to the Faire before? Last year was our first year going and if you're a newbie or need a refresher be sure to check out my post "Things to Know Before Bringing Your Family to King Richard's Faire." It's filled with tips to make your trip a success! Isabelle and Henry checking out the Cyclops last year. You never know what you'll see there! Not familiar with the Faire? Well here's some more information for you! Entertainment, exciting rides and skilled games abound on the enchanting 80-acre site of King Richard’s Faire. Hundreds of talented entertainers perform non-stop throughout the day. Visit any of the eight vibrant stages and be enthralled by acrobats, aerialists, jugglers, minstrels, dancers, fire eaters, puppeteers and exotic tigers. Witness the rare liger, beautiful white lion and cute tiger cubs. You’ll gasp as the King’s mounted knights battle on horseback, and laugh as bawdy beggars compete in mud. Strolling performers will engage you all day long as you frolic in our forest and try your skill at the Gaming Glen. Epicurean pleasures will tantalize your taste buds with the Faire’s unbelievable choices of truly scrumptious treats. Satiate your palate with spit-roasted giant turkey legs, boules of chowder and stew, ringlets of fryes, champagne, wine and brew! Discover over 100 talented artisans who journey from all over the country to display and hawk their magnificent wares. You will be delighted and intrigued by the fantastic glass blowing, portrait painting, hand-spun pottery, sword making, fabulous jewelry, leather and armor, period clothing, moccasins, perfumes and scented oils, face painting, and psychic readings. They also have lots of great contests to enter as well such as these great kid pleasing ones: “Children’s Fairies & Pirate’s Costume Contest” Saturday, October 12th at 4:00 PM on the King’s Stage and “Prince & Princess Costume Contest” on Saturday, September 28th at 4:00 PM. You can check out all the special events and contests by clicking HERE! Sound like fun? Well one lucky Dollops reader will win two adult tickets to the Faire (a $56 value). Enter with the Rafflecopter form below! *Disclosure: My family receives free tickets to the Faire. As always, all opinions are my own.